So this is the week we find out the gender of our little bump, if he or she cooperates. Sidenote: I read an article last week about how we should really stop referring to pregnant women as having a bump because it is negative about their body image or something like that. But it had never occurred to me to take offense to this phrase, nor can I muster any negative feelings toward the word even after reading the article… so I’m going to continue to refer to it as my bump. Lots of people have asked us if we are going to find out the gender… and my answer is really… of course! We are two TOTALLY type A personalities that love to plan and research, it never really occurred to us to not find out! I do however really admire the people who don’t find out, that has to be a really special moment after they are born to find out! My brother and sister-in-law didn’t find out, and it was such a fun surprise to find out she was a little girl! But I need to know… so we’ll just be surprised on Wednesday! For a Girl: I know that I am not a big pink or purple person, so if it was a girl I was unlikely to go with a massively pink room (although a few super cute and very girly rooms on pinterest nearly swayed me). I’ve always gravitated towards more of your primary colors: Red, Blue, Green, etc. In fact my senior year in college I roomed with two of my best friends in the sorority house, and we just brought along the bedding that we’d had for our previous four years: mine were red sheets with a blue jean duvet cover, Emily’s a pastel and polka dot theme, and Lauren tended toward the bright orange/turquoise and jewel tones. We then laughed a few years later when our first apartments and homes pretty much followed these same design tendencies! Anyway, back on track to the nursery: I decided if it were a girl I would use coral as my accent color. 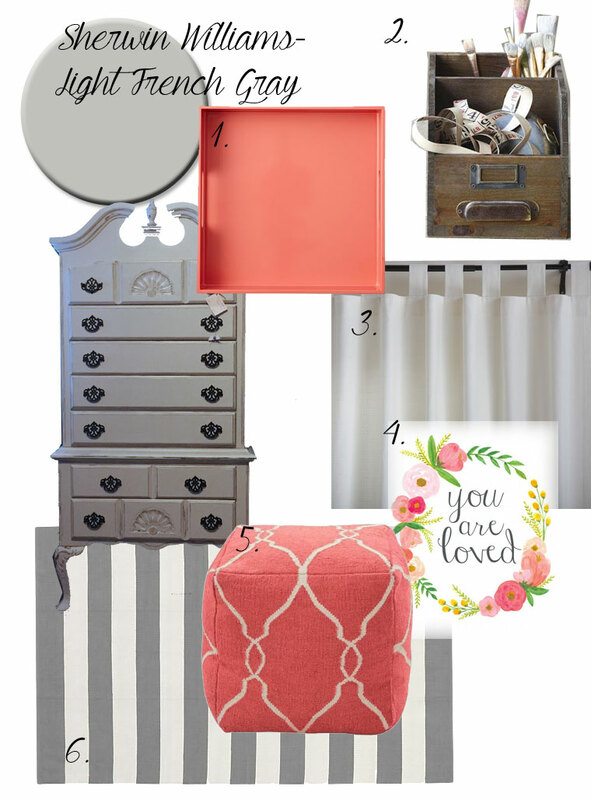 I think Coral is such a pretty color, and is definitely girly without being too pink. And BONUS coral seems to be a VERY popular color this year, so there are tons of cute things at Target and other shops that are just the right color, which should make finding accent pieces much easier! For a Boy: This should come as no shock to those of you who have been around a while, seen our wedding pictures, or just know me in general… I’m a sucker for Navy and White. 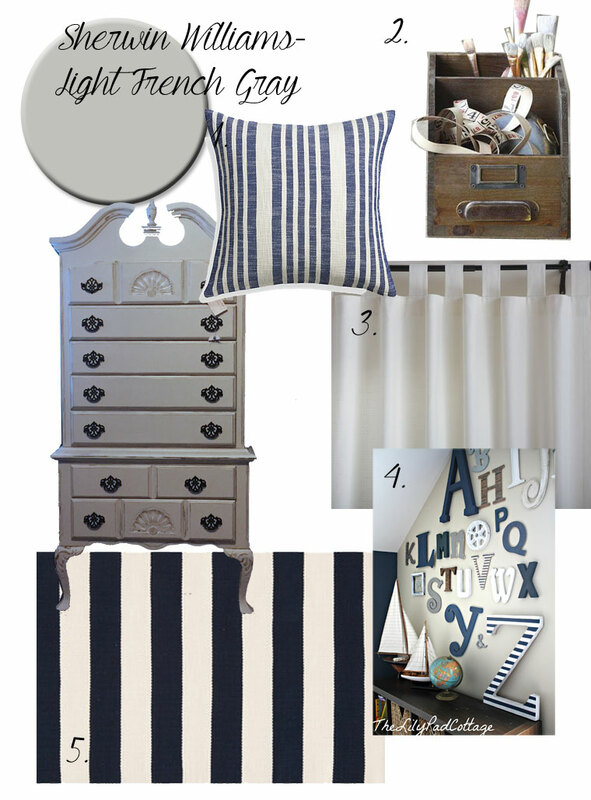 So I tend to gravitate toward a navy theme for a little boy. Not quite nautical, but just one step short. So, some of the elements will stay the same regardless of gender: the room is already being painted Light French Gray by Sherwin Williams (in fact, as I speak the whole house is being painted this color except for a few rooms, but more on that later this week), the highboy dresser was a spontaneous purchase when I was shopping in Waco with my sister-in-law, so it is already in the nursery, and I bought a few of these card catalog storage pieces when I was out shopping. 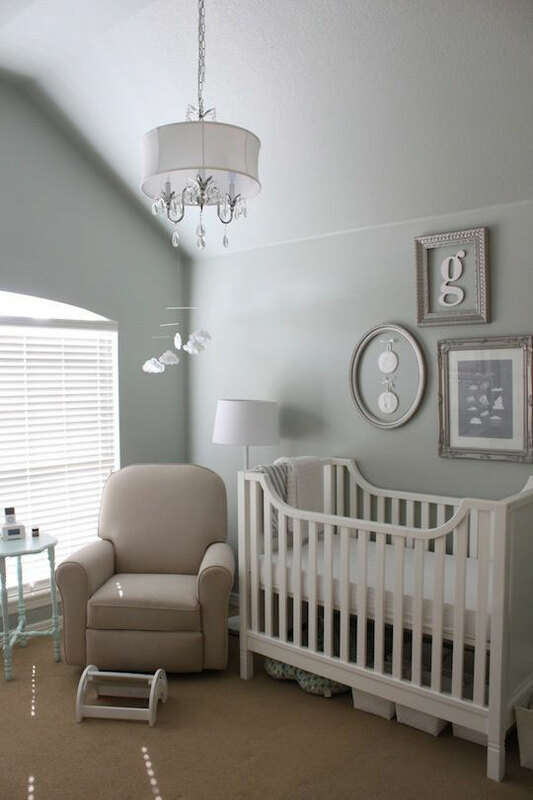 But these have been sort of my inspiration for where I want to go with the nursery… so stay tuned this week to find out if we will be going with Navy or Coral! I love them both so much! I can’t wait to hear the news!